In a small saucepan, combine raisins, rum, and water. Bring to a simmer, stir well, then remove from heat and leave to plump and absorb the liquid as they cool. Slice candied orange peel and split and scrape the vanilla bean; set aside. Heat milk in a small saucepan on low heat until lukewarm, then crumble yeast over it and add a pinch of sugar. Stir until yeast is dissolved, then cover and set aside until milk turns foamy, approx. 5 minutes. Add flour, remaining sugar, salt, citrus zests, vanilla bean seeds, and nutmeg to bowl of a stand mixer. Stir until combined. In a separate bowl, lightly beat the eggs, then add to the flour mixture. Turn mixer on low and slowly stream in milk. Increase speed to medium-low and mix until combined, then add some of the butter a tbsp. at a time. Mix until incorporated. Turn dough out onto a floured surface and knead for approx. 10 min. until smooth and elastic. Form into a ball, place in a lightly floured bowl, and cover with plastic wrap. Leave in a warm place to rise until doubled in size, approx. 1.5 hrs. Drain raisins and combine with candied orange peel. Turn risen dough onto lightly floured surface, knead for approx. 1 min., then knead in raisins and candied orange peel until evenly distributed. Form dough into a smooth ball and place in mold. Cover loosely with plastic wrap and leave to rise in a warm place for approx. 2 hrs. Meanwhile, preheat oven to 175°C/350°F. Use a sharp serrated knife to score an ‘X’ over the top of the panettone, then place the last tbsp. of butter in the center. Place panettone mold on baking sheet and bake for approx. 45 – 55 min., or until a wooden skewer inserted in the center comes out slightly moist but not wet. If the top of the panettone browns too quickly, tent with aluminum foil. 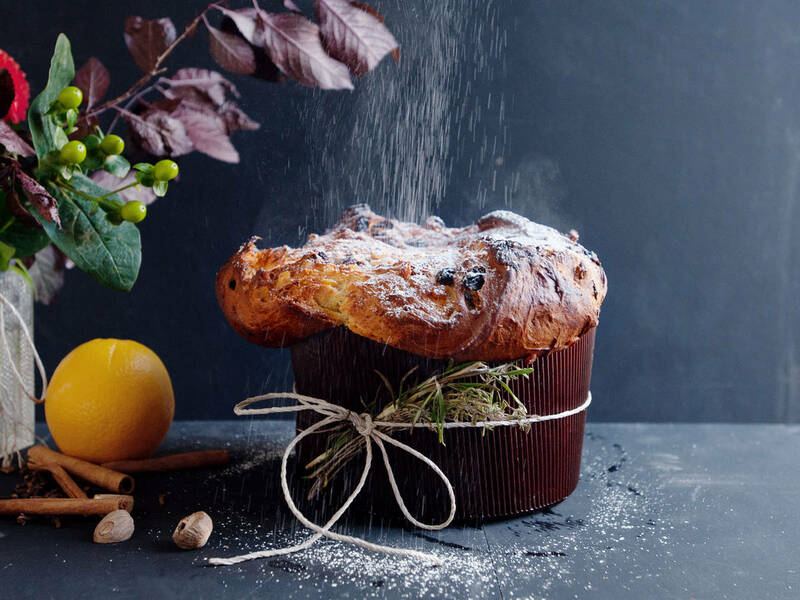 Place panettone on wire rack to cool completely. Slice and serve with a dusting of powdered sugar. Enjoy!